Preston North End started as a cricket club in 1863 – that’s 150 years ago – before switching to footy in 1878. 10 years later they were top dogs – or ducks – in the entire country, winning the very first Football League Championship and FA Cup double! North End are one of seven teams to win the double but they were the only ones to do so without losing a game. Forget Keith Keane, John Welsh and Will Hayhurst – it was all about John Goodall, Jimmy Ross and David Russell back then, with the trio scoring a massive 62 goals between them that season. This team of 1888 were named The Invincibles after completing the 1888/89 campaign unbeaten in the League and the Cup. The famous team played their home games in the same spot that the current players do today at Deepdale, which is the oldest professional footballing site in the world. The only other team to come close was Arsenal in 2003/04 when they remained unbeaten in the League but not the cup. 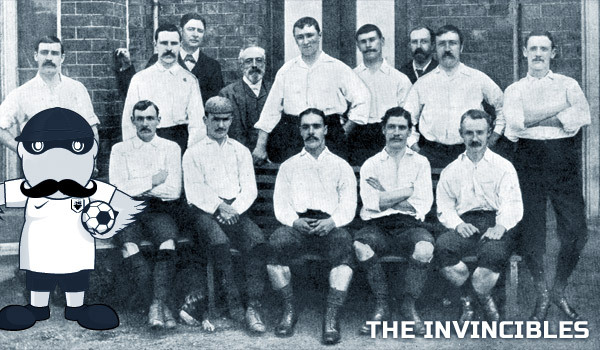 The Invincibles team were managed by William Sudell, who led them to a 3-0 victory over Wolverhampton Wanders in the 1889 FA Cup Final. Englishman Fred Dewhurst and Scottish players Jimmy Ross and Sam Thomson scored the goals. They had a 5,000 seater stand named after them at Deepdale in 2008, called The Invincibles Pavillion. Wembley with a penalty in the last kick of extra time – get in! The most famous of all the PNE footy stars is Sir Tom Finney, who spent 14 years at the Club. The local lad made a massive impact at Deepdale and is still the record goalscorer for PNE with 210 strikes. In 1996, Preston became the third team to have won all four pro English leagues! Since then it’s been a topsy-turvy time for all PNE fans. The Club’s been to three Play-Off finals, only to lose all of them. But with David Moyes in charge the Lilywhites did make it back to the Championship and almost made history with a surprise return to the top flight, when they narrowly missed out in the play-off final against Bolton Wanderers and then West Ham United in 2005. Now, with Simon Grayson as manager, the team hope they can copy the glory days of the past and get promotion soon!